I distinctly remember the first time I saw the Audi TT. It was in Northern California in 1998, and I looked on – agog – as the silver TT drove past. It bore more resemblance to a Lunar rover rather than an earthly sports car. Firstly, you couldn’t tell whether it was going forwards or backwards because it looked as though it had been sculpted from a single piece of billet aluminium – with no differentiation between front or back. That changed soon thereafter, following a few incidents on the Autobahn when the car did actually go backwards instead of forwards. This was apparently due to an overly slippery shell, and so a discreet lip spoiler was added for additional downforce. The second generation TT was more conventional, but still distinctly rounded in silhouette. It was also more hard-core – but, for our roads, a little too much. I last drove a TT that was shod with 19-inch rims on the roads of Mumbai, and had to make an appointment with a chiropractor the following day. So, as you can imagine, I was happy to note that the car you see here came rolling on far more usable – but still sizable – 18-inch wheels and tyres. But I needn’t have been worried, because the ride is as supple as you can imagine in a sports car. We all – auto journalists, that is – hanker for those pure sports cars with hard steering, even harder suspension, and harder still racing bucket seats. But the truth is that you simply can’t go down the road in one of these machines without your fillings falling out. And my dentist is expensive, so I’d like to keep them intact thank you very much! Fortunately, then, you won’t have any such problems with the new TT. On the road, the ride is sublime. But it doesn’t end there, because these modern sports cars really are something. The first time I lunged into a corner, I had to quickly unwind the wheel back. You see, the steering is as sharp as they come. It may not have incredible feel – that’s a lost art nowadays – but, fortunately, it’s as direct and responsive as you can imagine. The TT simply darts into a corner with the appropriate level of urgency that you would expect from a proper sports car. 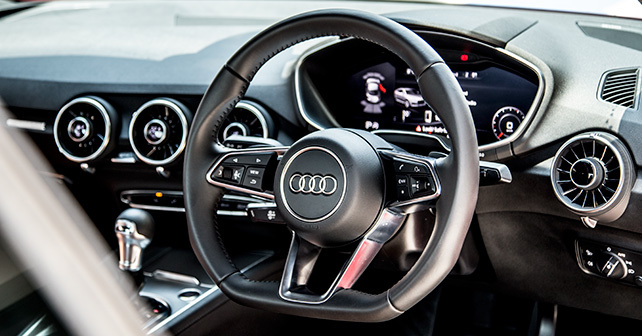 But, before we go any further, I can’t talk about the steering without mentioning the actual wheel itself. It’s a work of art. The other revelation with the new TT is the way it looks. The overall design is clean and taut, while the front end is decidedly edgy and sharp. On the whole, it works extremely well – and if it’s a sign of thing to come from Audi (which it is) then it’s a very good thing indeed. But, enough about ergonomics and appearances – what about how it performs at the BIC? Well, there’s one very easy way to answer that question as it turns out. 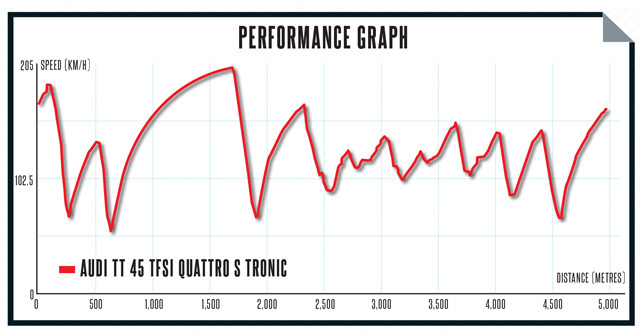 You see, it’s a full 4.7 seconds quicker than the last TT that we tested at the track. Granted, that was on a much hotter day, so the time difference is amplified – but this little stat is still a resounding acknowledgement of the progress made by Audi when developing this machine. A quick word of caution though – this is not a track car by any means. Yes, it turns in incredibly well, has only a hint of understeer on turn-in, settles into the mildest four-wheel drift mid-corner, and hunkers down on the power on the way out, but with just 227bhp on tap it could use a lot oomph at the racetrack. Plus, the brake pedal could be a bit firmer. But, when compared with the previous generation, it feels lighter and more lithe – which makes sense since it’s shed 50 kilos thanks to the extensive use of aluminium. Ultimately, the Audi TT 45 TFSI Quattro – in addition to being a mouthful – is the most versatile sports car you can buy today. It’s a car that’s just as comfortable on the road negotiating rush hour traffic as it is tearing around a racetrack at ten-tenths. It’s as easy to drive on the limit, as it is while making the school run. The dentist won’t be happy though, because he’ll have to look elsewhere for his Diwali bonus. The engine is incredibly refined and responsive. In fact, it reminds me of the rotary-engined RX8 – it’s that smooth. And 370Nm of torque kicks in at just 1,800rpm. 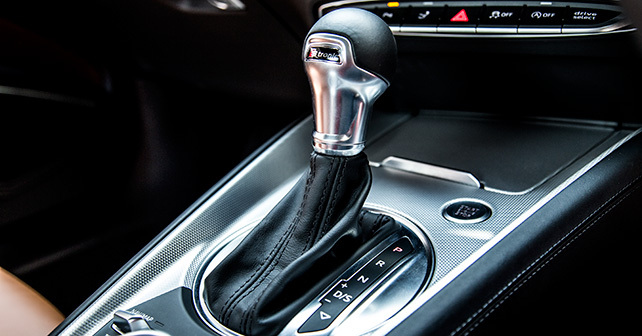 The six-speed dual-clutch gearbox is a work of technological perfection. Upshifts at 4,000rpm, while on the power, result in a pleasing bark from the exhaust – all the better to add a little drama. And that’s what this car is about – being usable, but with small, manageable doses of excitement. If I had to choose a sports car in which to commute in every day, as well as to indulge in a little play over the weekend, this would be it!